Call (303) 683-5033 to discuss your case. Are you facing a tough legal battle ahead, or having trouble obtaining injury benefits owed to you? Sounds like you need an experienced attorney who can fight on your behalf and be committed to winning your case, no matter how long it takes. The Babcock Law Firm pledges to give you aggressive, passionate and superior legal services for incidents involving personal injury, workers' compensation and insurance disputes. Best of all, committed representation begins with a no-cost, no-obligation case evaluation and initial consultation within 72 hours! Personal injury and workers' comp attorney R. Mack Babcock and his team of skilled legal experts passionately represent clients from all over the state, including Denver, Littleton, Aurora, Boulder, Lafayette, Broomfield and other Colorado cities. Workers' Compensation – Getting injured on the job is devastating enough. But having to fight for your right to benefits or a settlement in a protracted legal battle can take an even greater toll on you and your family. Car Accidents – When recovering from an auto accident, recouping financial losses may be the last thing on your mind. However, Colorado law sets a limit on how long you have to file a claim and obtain compensation for injury and property damages. Truck Accidents – Colliding with a large commercial truck is not only more deadly, its legal implications are much more complicated than regular car accidents. Claimants must file suit against the truck driver, their insurance company and the trucking company. Pedestrian & Bicycle Accidents – Getting struck by a vehicle while walking or riding your bicycle can result in a life-altering injury, but unfortunately, victims aren't automatically guaranteed compensation in Colorado. Pedestrians and cyclists must be able to prove that the driver failed to observe the proper rules of the road. Motorcycle Accidents – Accidents involving cars and motorcycles are oftentimes extremely serious and sometimes deadly. In these personal injury cases, having a lawyer on your side who understands the nuances of motorcycle accident litigation is imperative. Drunk Driving Accidents – Colorado has a serious problem with drivers who are intoxicated by alcohol or drugs getting behind the wheel. DUI accidents typically lead to both criminal and civil charges. An attorney with special knowledge in these types of cases is necessary in order to obtain your full extent of compensation. Injured Truckers & Cab Drivers – Having to work for a living by driving all day on Colorado roads is one of the most dangerous professions out there. Truck drivers, cabbies and chauffeurs – even independent contractors – should be aware that they are entitled to more than just occupational accident compensation in the event of a job-related injury. Slip & Fall (Premises Liability) – As the 2nd leading cause of injury in the U.S., a slip and fall can occur just about anywhere – at the grocery store, theme park or person's home. In many cases, the property owners should be held liable for medical costs and lost wages you accrue. Insurance Disputes – When an insurance company fails to uphold their end of the bargain even though you've been paying your monthly premiums, you may need to file a bad faith insurance claim. If the stakes are high, the legal battle may be complex and drawn out. Wrongful Death – Losing a loved one because of negligence is perhaps the worst personal injury a person can face. In these worst-case scenarios, nothing will be able to fill the hole left behind by the person's absence, but filing a wrongful death lawsuit can help compensate you for funeral expenses, lost wages and pain & suffering. call (303) 683-5033 or contact us through our website and you will hear back from us shortly. 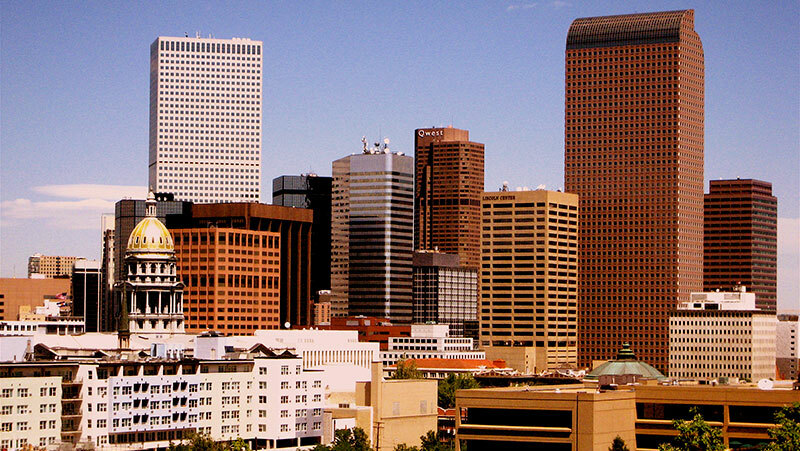 Photo "DenverColoradoSkylineViewFromtheSouth" by Midimacman at en.wikipedia. Licensed under CC BY 3.0 via Commons.